PROS: This budget phone is easy to program and to use. It comes with photo memory buttons that are good for anyone with low vision. It is also good for mild hearing loss because it has up to 26 dBs of incoming amplification. CONS: Not a lot of features. No caller ID, speakerphone, answering machine. The programmable numbers will be lost after half an hour if there is a power failure since there is no battery backup. SUMMARY: For anyone who has low vision or and has some hearing loss and needs a basic, inexpensive phone to keep in touch with relatives and friends, this is a decent option. There are a lot of amplified phones on the market that offer many more features, but they come with a higher price tag. If you don’t need the extra features but just need a bit of amplification when talking on the phone, the Clarity Amplified Photo Phone is your best bet. The Clarity Amplified Photo Phone (model number P300) is your best option if you are looking for a basic budget corded amplified phone. It has enough features for anyone who just wants to make a phone call and doesn’t need all of the bells and whistles to do it. If you are on a budget the $50 price will get you a phone that is well made and that has excellent reviews. Since this is a basic model, you don’t get features on it like an answering machine, speakerphone, call-waiting or caller id. It does, however, offer nine programmable photo buttons that you can press without having to dial a number, making it easy to dial for anyone with low vision. One problem with the programmable photo buttons is that if there is a power outage the numbers only save for about half an hour and then they are lost and have to be re-programmed. If you are buying a phone to program and then send to a relative this is not a good model for that; you will want to look for a phone that has a battery backup to store the numbers for shipping. Since a lot of people who purchase amplified phones also use hearing aids, this phone is hearing aid compatible. It can also be directly connected to assistive listening devices or headsets to help boost sound levels for those who find it difficult to hear when speaking on the phone. Another useful feature for anyone who is having hearing difficulties is that it has a very bright visual ring indicator, so if you don’t have a hearing aid in, or have trouble hearing the phone ring you may see the visual indicator flashing. As with most amplified phones, it also offers an adjustable ringer pitch and volume control, letting users customize the sound to their personal sound preference. One other notable feature is that it comes with wall mount options. Also since it is a corded phone, you can also use it when the power is out, as opposed to a cordless phone, which is unlikely to work in a power outage. It used to be that this model (Clarity Amplified Photo Phone P300) amplified incoming sound up to 18 decibels which is on the low side of things. But Clarity seems to have modified this, and now the P300 can be amplified up to 26 dbs. If you buy directly from the Clarity website or Best Buy, you should get a higher level of amplification. Amazon still seems to be selling the 18 dB amplification model, so presumably, this is an older version of the P300. The highest level of amplification that I have seen on an amplified phone is 60dBs, so if you need a lot of amplification, then this isn’t the phone for you. This phone would suit someone who needs a slight boost in hearing when talking on the phone so anyone with mild-to-moderate hearing loss or low vision. The ringer of the phone can be amplified up to 75 dB louder than a regular phone ringer. So this would be an excellent phone for someone who misses calls if they don’t hear the ringer. There is no amplification on outgoing sound, which is a useful option for users who speak quietly and also have hearing loss, some of the higher end amplified phones offer outgoing amplification. 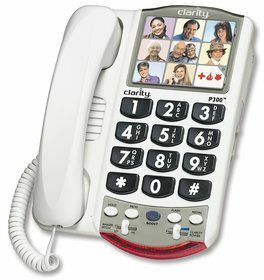 This phone is made by Clarity who have an excellent reputation in the amplified phone market. They use something called Clarity Power technology (which is a patented technology) that amplifies and shapes high frequencies to enhance the sound. Generally, the sound quality is better with corded phones as opposed to cordless or cell phones since they have primarily built-in speakers and you don’t have to worry about interference. You can also customize the sound levels since this phone features adjustable ringer, pitch and volume controls. Clarity offers outstanding support for all of its products. You can reach their Customer Support Center at 1-800-426-3738. The P300 phone has a 1-year manufacturer’s warranty. Not a lot of features. No caller ID, speakerphone, answering machine.